British Library MS Harley 913 is known as the 'Kildare Manuscript' from the authorship of one of the poems by the Franciscan, Friar Michael of Kildare. The collection was written in the 1330s, in Ireland, perhaps in Waterford. It is chiefly known for two poems in particular, often anthologised, but now presented in their literary and cultural context: 'The Land of Cockaygne,' a fantasy of a culinary and sexual earthly paradise, and 'Lollai, lollai, litel child', a lullaby warning the baby of what is to come in later life. 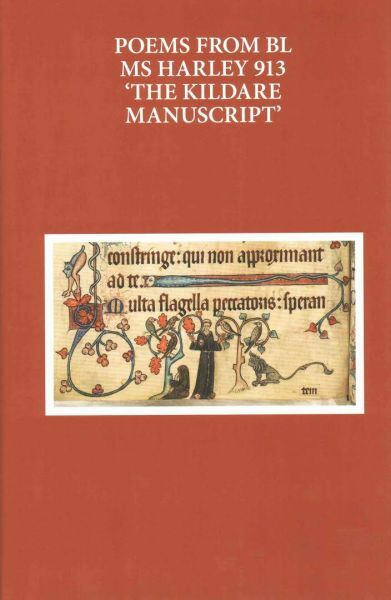 The manuscript contains 17 English poems, 12 of which were probably composed in Ireland, three Anglo-Norman poems, and many Latin items in prose and verse, including Goliardic satire, preaching materials, and matters concerning the Franciscans and their history. The English poems include a description of the humiliations of old age, a satire on the inhabitants of an unnamed Irish town, a celebration of the massacre of native Irish, a complaint about the corruption of those in power, reflections on Christ's passion and guides to basic Christian doctrine. A French poem gives a detailed account of the building of defences around New Ross.